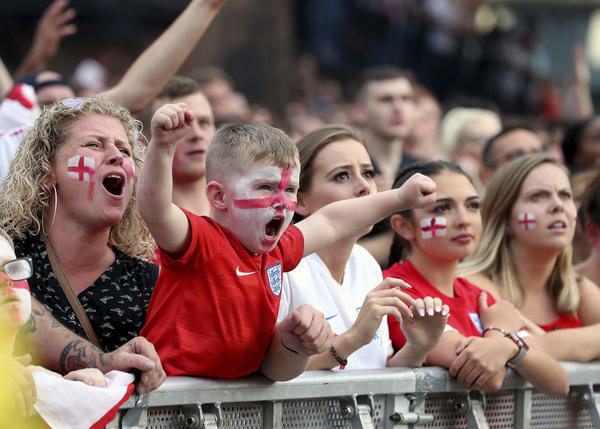 Fans cheer as they watch the 2018 World Cup semi final match between Croatia and England in Russia, at the Castlefield Bowl in Manchester, England on Wednesday. On June 30, NPR's Weekend All Things Considered aired a lighthearted World Cup piece discussing why the Brits use "football" and the Americans use "soccer" to refer to the same game. The subsequent debate this piece sparked has nothing to do with soccer and is not remotely lighthearted. In the piece, one of the interviewees, a man, was referred to as the author of a book that deals with the subject. As a correction on the piece now notes, the book had two authors, one of whom is a woman. It was a shockingly bad error. Recent corrections have put a spotlight on issues of representation, in the newsroom and in NPR's content. Listeners and readers have questioned how these errors came about and, by extension, what they say about NPR's commitment to hiring and source diversity. Those issues are monumentally important. They are why I ask NPR to give me the statistics on the diversity of the newsroom staff every year so I can post them, and why I have written a number of times about the issue of source diversity. My office has been working on two more columns on the topic of source diversity for several weeks now — begun well before the recent controversies — and they will be posted soon. But my role is also to understand the specifics of what happens when NPR makes a mistake and whether it in fact signals a broader challenge for the NPR newsroom. (The Ombudsman office is independent of NPR's newsroom and management. I speak only for myself, not NPR.) In the case of the soccer story, the answer is complicated. The female co-author who was not acknowledged in the NPR piece — Silke-Maria Weineck, a professor of German studies and comparative literature at the University of Michigan — has written her own perspective on this situation for The Chronicle of Higher Education. Her piece touched off a robust and important debate about the challenges that women face in being heard in the public square; it has also resulted in a good number of angry emails to NPR. It's not my place to fact-check articles in other publications. But I've now talked to the NPR editor who oversaw the piece, and the reporter, Anders Kelto, and emailed with both authors. I've also listened to the raw audio of the interview and reviewed the emails between Kelto and the co-authors. Here is my best assessment of what happened. Kelto is not an NPR employee. He contributed many pieces to NPR for four years from 2010 to 2014, as a freelancer, and then worked for NPR for about a year. He left NPR in 2015 but continued to contribute occasional pieces (he also contributes to other non-NPR radio programs). While at NPR he reported a piece for Morning Edition on the economic effects on countries that host soccer's World Cup. For the piece he interviewed Stefan Szymanski, a professor of economics and sport management at the University of Michigan. Szymanski was also the sole author of a 2014 research paper, "It's Football Not Soccer." With the World Cup coming up, Szymanski emailed Kelto to tell him about the book he had co-written, on the same topic, with Weineck (they self-published it in March). He asked if Kelto was interested in "reviewing or covering it in some way?" Kelto was interested but told me: "My goal was to create a fun, lighthearted piece about the fact that many British people, ironically, criticize Americans for using a term that was invented in England. Weineck and Szymanski were interviewed as potential experts on the topic. It was not a book review or a story about Weineck and Szymanski's book." NPR accepted Kelto's pitch. The joint interview — the co-authors in one studio and Kelto in another — ran 26:37 minutes, including preliminary set-up conversation (the actual interview was just under 24 minutes). Kelto told them at the beginning that: "In my mind, this is a piece about how the British use of the two terms has changed over time, and the possible reasons for that" (in other words, Kelto seemed to be clear that he was not planning a piece specifically about the co-authors' book. Szymanski, by contrast, told me that for him and Weineck, "it was always about the book"). During the interview, Kelto asked questions of both authors; Szymanski did most of the talking. Kelto told me: "I did not know what contributions Szymanski and Weineck had made to the book, so I asked open questions, gave each of them an opportunity to respond, and allowed them to answer based on their areas of expertise." At the end, Kelto told them that he would likely use a very "small percentage of everything that we just talked about. It will probably be like a three- or four-minute story." Later, Kelto emailed Szymanski and asked for names of historians to add a different perspective. Szymanski sent back the names of three men who are professors at British universities, one of whom Kelto interviewed. The piece that Kelto turned in to NPR's Southern bureau chief Russell Lewis was about one minute longer than the 4 minutes 30 seconds that had been allotted, Lewis said. It included only the two male voices, he said. During the editing process, Kelto said he told Lewis about an anecdote that Weineck recounted in the interview; both agree that they decided it was too long to fit in the time constraints for the piece. The final draft of the piece called Szymanski the "author" of the book. Lewis told me he fact-checked the story before it aired, including the main points in the debate and the title of the book. He said he "did not notice that there were two authors instead of one." Kelto let the co-authors know in advance that Weineck's quotes did not make the cut. After the piece aired, they both, separately but within a half-hour of each other, emailed him to express their unhappiness that Szymanski had been called the sole author of the book. Kelto sent a joint reply apologizing. He immediately asked NPR for the correction, which was changed in the audio on July 1 and corrected online on July 2. That follows NPR's protocol. Kelto also let the two know that the correction had been posted and apologized again. Those are the facts as best I've been able to determine. What were the mistakes here? The main mistake was referring to Szymanski as the sole author; he was not. It's hard to understand why Kelto made the mistake; when he did, Lewis should have caught it. As any trustworthy newsroom does, NPR quickly posted a correction. In her opinion piece and her public Twitter feed and Facebook posts, Weineck calls what happened "my erasure." She was definitely erased, to use her word, from co-authorship. NPR has corrected that. But was it a mistake — or, to use Weineck's framing, was it a deliberate slight against gender — for Kelto not to use an actual sound bite from Weineck? Whom to quote is a dilemma that reporters face frequently when they talk to more than one person for a story. Lewis told me: "When working on a story, reporters talk to a variety of sources. It helps in the research, understanding and context of complicated topics. The process can involve talking to many people to ensure a story is clear. Not every person who is interviewed for a story actually makes it into the final piece." The same thing applies when NPR does stories about academic articles written by multiple authors. When many authors are involved, often only the "lead" (or first-named) author is interviewed for reasons of time and clarity. In this case, there were only two authors for the book, and Kelto interviewed both of them, but mistakenly named only one. Often, the online version of a story will include a link to the actual book or study where interested listeners can see the full list of co-authors, but there was not a more in-depth online story in this case. I'd add that the focus of stories can also change in the reporting (although the reporters should clearly communicate that to their sources when that happens). Also, many reporters "over-report." They are concerned about getting the right quotes and the full perspective. Or they reach out to three people, hoping one will respond, and when all three do they are left with too much material for not enough space or time. Or they interview someone at length and that person does not say anything quotable about the story's topic. That scenario occasionally presented itself when I was a reporter (for print publications). When possible, I would sometimes try to include a paraphrased comment from the person and their name. But that's easier in print than on the radio, where there is far less time to tell a story. In my review of the joint interview of the co-authors, it seems to me that Kelto picked the most relevant quotes for his piece, fulfilling the first responsibility of journalists: to tell the clearest, most accurate and informative story for the audience. Kelto told me: "Szymanski's comments directly addressed the central topic I wanted to explore in this story. In particular, he explained how the usage of 'soccer' has changed in the British press over time and the theory that British people stopped using the term when a new U.S. professional league attracted global attention. Szymanski also grew up in the U.K., so he was able to speak about having heard the word 'soccer' used there." Had the piece been focused solely on the book itself, I would feel differently. But it was not; the book was merely the vehicle for telling a broader story. In this case, one could even argue that Kelto could have chosen to interview only Szymanski, since he wrote the 2014 research paper. But that raises a different issue. Many newsrooms, including NPR's, are grappling with an uncomfortable reality that they interview far more men than women. Why this continues to be the case, and how to fix it, is an active conversation in at least some parts of NPR's newsroom. One of the most important steps in improving diversity of sources can come during the conversation between a reporter and editor before the reporting starts. That's when the editor should make clear that a piece should, if possible, include diverse interviewees. And in this case, when Kelto realized that Szymanski's quotes were the most relevant from the first interview, he could have avoided having only male voices by digging a little deeper. For example, he could have looked for female British historians or experts who could speak to his topic, instead of the men whose names he was sent. Many women this week have written about the challenges they face in academia when their voices are not heard publicly — they get paid less, for one. This is not just an academic issue and not just a gender challenge. It also is not the sole responsibility of newsrooms to solve. Nonetheless, newsrooms need to do a much better job of seeking out, quoting and drawing attention to people who represent a wide range of ethnic, racial, geographic, class — and yes, gender — perspectives. Kelto told me of calling Szymanski the author and not the co-author: "I made a mistake and I am sorry for that." One more point: Kelto made another mistake here that I think is important to note since it speaks to NPR's ethics code. Kelto has been accepted to the Knight-Wallace Fellowship at University of Michigan, and starts in the fall. Prior to the interview, he had asked whether Szymanski might consider serving as his adviser during that time and he agreed. His NPR editor needed to know that (and the on-air piece should have disclosed that). This is because NPR has a policy that reporters — even freelancers — must not report on people with whom they have a relationship, without acknowledging it. To sum up: In my opinion, NPR's main mistake here was calling a source the author of a book when he was a co-author. But it was within newsroom norms to use the quotes that were used. That said, the conversation about diversity of sourcing is vitally important and needs to be factored in to the reporting process at all levels and far more often than it is. Editorial researcher Annie Johnson and intern Jeanine Santucci contributed to this piece.